A 6% yield, a recent increase, and a decades-long path to growth should have Caretrust on your dividend stock shortlist. On the surface, it may seem like Caretrust REIT Inc (NASDAQ:CTRE) is a stock investors may want to avoid. As a real estate investment trust, its business uses a substantial amount of debt to acquire the properties it owns and leases to tenants. And with interest rates already starting to climb, REITs are set for tough days to come. This is the main reason why Caretrust's stock price has already fallen more than 30% from its 12-month peak. 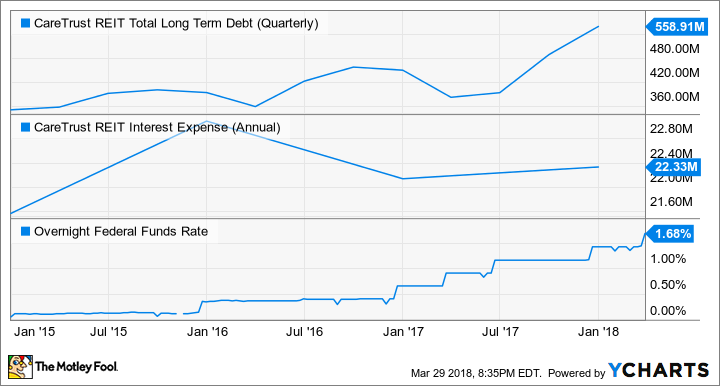 While the idea is that rising interest rates aren't good for companies that use a lot of debt, it's also an oversimplification to draw a line between rising rates and struggles for REITs like Caretrust. To the contrary, my analysis is that the market's reaction to rising rates has created a wonderful opportunity to invest in Caretrust. To take it a step further, I think it has created a scenario where Caretrust has become a dream stock for dividend investors, paying a substantial yield that's well within its ability to maintain and setting a trend that could drive decades of growth. REITs like Caretrust often rely on debt. As a young, small company with an aggressive growth strategy, Caretrust's future prospects will require using more debt to grow, and rising interest rates will mean a thinner margin of error for making the most out of its acquisitions and expansions. But that's only one aspect of what will determine its success or failure, and a good management team should be able to navigate any economic or interest rate environment and succeed. One of Caretrust's strengths is its management team, starting with CEO Greg Stapley. Stapley was a co-founder of healthcare service provider Ensign Group, from which Caretrust was spun out in 2014. At Ensign, he played a key role in building the real estate portfolio that Caretrust took in the spin-off and has been a driving force behind Caretrust's growth strategy so far. This was partly due to timing of interest payments but also management opportunistically refinancing its debt at a lower cost, even as rates were climbing. Early in 2017, the company issued $300 million in senior notes due in 2025 at 5.25% and used most of the proceeds to pay off $260 million in senior notes that paid 5.875%, as well as pay off and terminate a higher-cost revolving credit facility. That's not to say the company will always be able to gain lower rates, but management's past actions are evidence that they are skilled capital allocators. If that proves true, the company should continue to have access to debt at reasonable rates. Caretrust's main business is owning skilled nursing, assisted living, and other retirement housing for seniors. The company partners with healthcare companies and senior housing operators that lease its properties, generally on long-term, triple-net contracts with built-in price escalators. This means steady, predictable cash flow for the company with less operational burden, which the healthcare specialists it partners with are responsible for. So while there is some risk that rising rates will weigh on the company's ability to grow cash flow going forward, there is a significant social trend that's in the company's favor: aging baby boomers. According to a Harvard University Study, the 65-plus population in the U.S. will expand to nearly 80 million people by 2035. It is estimated that 1 in 5 Americans will be 65 or older by 2035. And while many seniors will continue to live independently or remain at home with aid from family and paid providers, a significant portion will need the care and support of an assisted living or skilled nursing facility. Add it all up, and the current supply of properties won't come close to supporting future generations of older Americans, especially those over 80, which will substantially increase in number. According to the Social Security Administration, most Americans who reach age 65 will live into their 80s. In the three years since going public, Caretrust has leveraged its small size to grow quickly, and with still fewer than 200 properties, I think this management team can continue to grow at a fast pace -- and certainly faster than the overall industry -- for many years to come. As much as its stock price has fallen recently, Caretrust's business is more stable than the market seems to realize. Over 80% of its total rents are locked into long-term leases that don't expire until 2029 or later, while less than 10% of its rents expire before 2027. Furthermore, the industry it serves is recession-resistant and is a critically important need for a vulnerable portion of the population, two things which should further secure future cash flow and keep the dividend safe and secure. And with wonderful growth prospects as America's baby boomers age, there's a lot that dividend investors should like about Caretrust. Add in the recent market sell-off that has pushed the dividend yield above 6%, and Caretrust should be at the top of every dividend investor's shortlist.